Mention the Grand River over a frosty pint in a local pub and most fly fishermen assume you’re talking about the stocked brown trout fishery in the tailwater between Shand Dam at Belwood Lake and West Montrose, 25 kilometres southwest. But the 280-kilometre river, which meanders through southwestern Ontario from Luther Marsh in the Dufferin Highlands (one of the largest inland wetlands in southern Ontario) to Port Maitland on the north shore of Lake Erie, is a diverse fishery. Designated a Canadian Heritage River in 1994, the Grand is the longest river entirely within southwestern Ontario, boasting more than 82 species, comprising more than 50 per cent of the species found in Canada. Not all are game fish, but in addition to hatchery raised brownies, there’s pike, walleye, resident rainbow trout, steelhead, perch, mooneye, smallmouth bass and channel catfish (on a recent trip to fish the portion of the river running through Brantford an angler showed me a photo of a 50-pound catfish he caught at Wilkes Dam). When water temperatures exceed 70 degrees — the point where it’s inadvisable to target brownies — the enthusiastic fly angler need not store away rod and reel until water temperatures cool down in September. 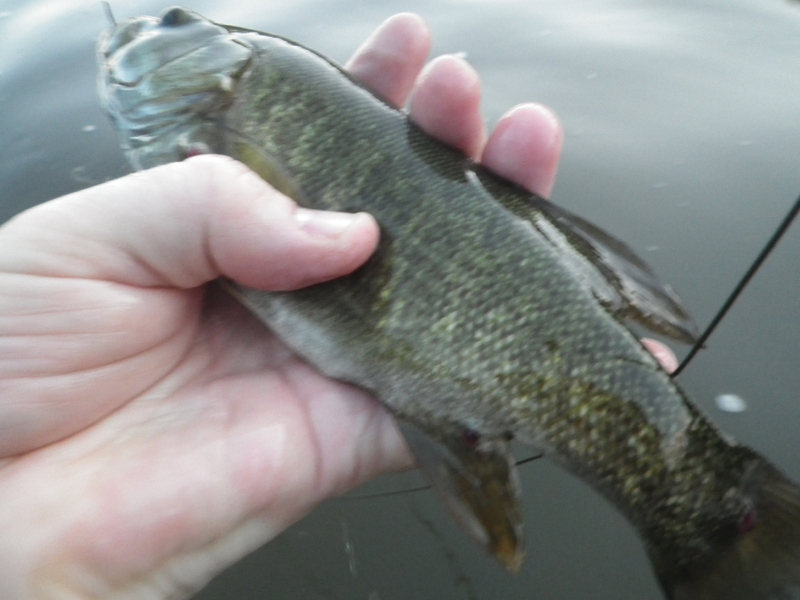 The Grand between Cambridge and Paris is a smallmouth bass factory. 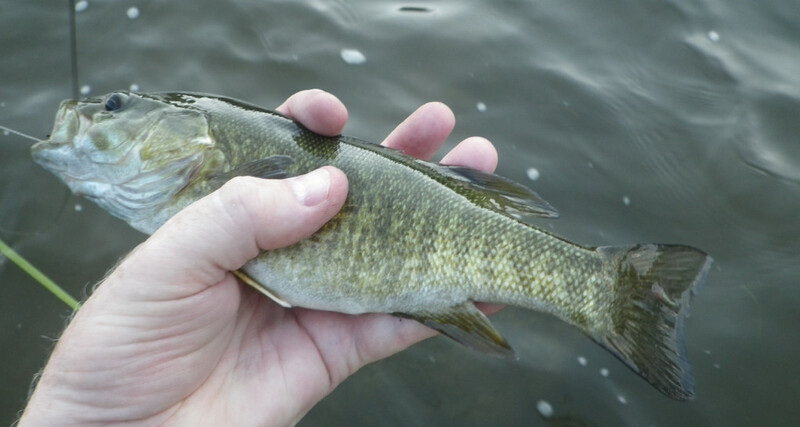 The majority of bass don’t grow much beyond 13 inches — at least the ones I’ve caught or the ones I’ve seen angling buddies catch. No matter. They fight with the feisty determination of diminutive linebackers on PEDs. The smaller ones — those in the eight to nine-inch range — jump acrobatically as though catapulted from an aquatic trampoline. These qualities make for an evening of high summer fun with a four or five-weight fly rod and a box of juicy nymphs, small minnow patterns and streamers (including woolly buggers and Clouser minnows) for subsurface prospecting and Dahlberg divers and small poppers for top-water action. Fishing for trout in large streams or small rivers remains my favourite form of fly angling. But I love catching bass, either from a canoe on sun-dappled lakes or wading in the flowing current of coursing streams and rivers. Depending on the conditions — when you get to my age cold water slows down the blood flow to perilously dangerous levels, at least according to my temperature-sensitive brain — wet-wading in shorts and an old pair of running shoes is emblematic of the joys of summer angling reminiscent of far-off childhood days. On this mid-August evening I’m on the Grand with my fly fishing buddies Dan Kennaley and Jeff Thomason, a professor at the University of Guelph when he isn’t casting fur and feather (not only in Ontario but in such lovely places as his native England, Scotland, the Catskills and the Yucatan Peninsula). Dan and Jeff have been fly fishing companions for near-on a quarter century. They are competitive in a friendly way. In fact, Jeff proved the exception to the rule on this stretch of river by landing a ‘hawg’, to use the term of endearment favoured by the tournament bass boys. Dan documented the trophy with a photo. I should add I also hooked a big one, but he escaped as I bent down to lip him. Excitement eclipsed by disappointment — the angler’s mantra. Another time I landed 18 small bass (under 10 inches) in a span of 45 minutes. Still exciting. Notwithstanding my brush with piscatorial achievement, I remain a step behind both; they almost always out-fish me — sometimes by significant numbers, sometimes by not so much. It was a lovely evening, hot but not as humid as it had been in recent days. Because of much-needed rain, the river was a little higher and stained more than was ideal. Nonetheless, wading was relatively easy, considering this portion of the river has some unexpectedly deep pools and large submerged rocks that require alertness and care. Dan and Jeff caught bass numbering in the low teens, with a couple each exceeding 12 inches. I landed seven, the largest measuring (according to my outstretched hand from tip of baby finger to tip of thumb) nine inches. The outing was memorable for me because it was the first time I had a camera to snap a couple of pics. Crayfish patterns are the ticket along this stretch of river. Dan ties a custom two-legged woolly bugger which is very effective. He also used a Mickey Finn, named by one of his outdoor heroes, Greg Clark. Jeff ties a juicy crayfish pattern with lead eyes. I was successful with a store-bought beige crayfish pattern and a black bead-headed wooly bugger, with a couple of slivers of cherry red tinsel and four pairs of thin rubber legs extending from both sides of its body — a steelhead fly I purchased in a fly shop in Victoria, British Columbia. The fly had been successful a couple of weeks previously on a Muskoka lake I fished with Dan from his canoe. I take a less-is-more traditional approach by casting across and letting the fly swing down. I mix up my retrieve. 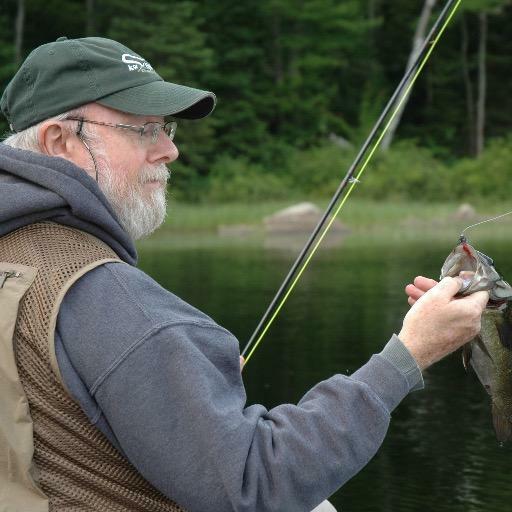 Jeff, who likes experimenting outside of the box, enjoys success casting his streamer upstream. I won’t be any more specific; if you want details, talk to Jeff. This is rich farm country. I enjoy the pastoral tranquility. However, we weren’t the only ones savouring the Grand. During the three hours we were on the water a couple of quartets of canoeists took advantage of the high water and paddled downstream, with hearty greetings. My partner Lois and I have canoed this scenic stretch of river and it’s clear to me it would be both productive and rewarding to paddle or kayak downriver, floating and fishing at promising pools and runs. I have read accounts of places where fly anglers view canoeists as warring rivals on the water. This has always seemed ridiculous to me because I believe that both sporting/recreational groups share much in common including a compatible or complementary eco-friendly philosophy, practical aesthetic and attitude. Surely there is room enough for fly anglers and canoeists on our streams and rivers, provided each group extends to the other common courtesy. For example, I stop casting when canoeists pass and I expect them to give me as wide a berth as possible so as not to disturb where I’m fishing. Canoeists weren’t our only companions. A great blue heron took flight upon our arrival, and before we left, a small rambunctious chevron of Canada geese flew along the river’s flight path, with a lone straggler pulling up the rear. Funny how annoying geese can be when pooping all over city parks, but remain icons of Canadian wildness in their natural habitat. ‘It was a great evening of fishing,’ Jeff rhapsodized walking back to the cars. I couldn’t disagree. Later, at the Black Badger pub in Cambridge, he rephrased his impromptu tribute to Grand River smallies. ‘What a lovely evening.’ Again, I couldn’t disagree. Sipping on a cool Boddingtons, Dan simply nodded in agreement. If you want to learn more about Grand River bassin’ I recommend the second edition of Fishing Ontario’s Grand River, edited by Steve May and published by the Grand River Conservation Authority. This also is a must-read for trout fishing in the tailwater. 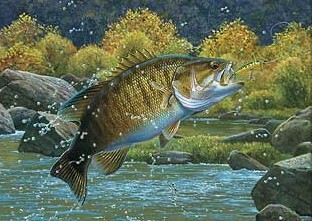 If you want to read a book to help you improve your bassin’ skills I suggest Bob Clouser’s Fly-Fishing for Smallmouth in Rivers and Streams (Stackpole Books). Steve and Ken Collins of Grand River Troutfitters co-authored a brief summary of fishing the Grand’s ‘Exceptional Waters’ between Paris and Brantford.